I set the camera to manual mode and either F5.6 to F11 depending on how much natural light is in the scene and how close the subject is to the background -higher Fstops will give you more detail in the background and sometimes it can be distracting. One of my best dragon in flight shots from last year was with the Fstop set to 5.6. I want to keep my shutter speed at or higher than 1/640 of a second since Im hand holding a long lens (forget the 1/focal length rule for this type of shooting it doesnt work) and while looking through the lens in the general area where I expect to take the photo I want to see that the light meter is hovering around the -1 EC mark. Ill adjust the ISO as necessary, but its pretty common for me to shoot natural light close-ups at ISO 400. NoiseWare Professional is extremely good at removing sensor noise and preserving detail, and for this type of shot I dont need to see every lens in the dragons compound eye anyway. Lately Ive been using a 580EX II camera mounted with a 1/8 grid (to keep from throwing light everywhere) and with a ¼ CTO gel (to warm up the light from the flash). Since Ive got an 81A warming filter on the lens I can turn what would be a rather harshly lit scene into one that looks more like it was shot in the early morning or late evening. Adjusting the white balance in post does not have the same effect, but if you dont want to use the warming filter then you might not want to use the CTO either. In post youll have two completely different light sources (harsh ambient and warm flash) and there wont be much that you can do to fix it. In post I raise the exposure, bump the contrast, sharpen the image with the auto focus option in Elements (easier to use than USM less of a chance that Im going to over sharpen the photo), run NoiseWare to remove sensor noise, adjust the levels to set a black point, add my copyright info to the EXIF data and save the image. 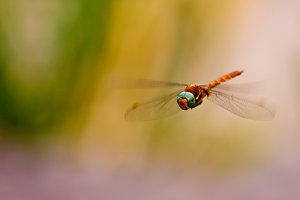 A tutorial on shooting dragonflies in flight. Thanks heaps!, … of course it is pouring down in Brisbane at the moment and I want to go out and try. I really appreciate these tutorials. But that “Clockwise gets close” is only right for Canon! Every other brand has the directions the other way round. Though you might get the impression sometimes.. bad thing most the people who don't know a thing about photography will choose a Canon though an other brand might be better for their needs..
Well for you it is a difference. You actually shoot with some kind of a pro lens. Those Canon lenses are some fine piece of work, there is no doubt, as soon as you go for the expensive ones. But everyone new to the topic will say: "Hey, all the pros are using Canon - so I'll have to get a Canon, too, to be able to get good photos"
And then they will buy a Canon in the lower price category where Canon is not outstanding from the other brands. Most time you will have better offers in the low budget area of photography than a Canon..
i must ask though, does the 180mm lens perform well with the 1.4x extension? The 180L works very well with Canon's 1.4x teleconverter -plenty sharp! The only drawback is that you lose a stop of light so the view finder looks a little darker. Oh okay, thanks for that. The pictures were cropped a bit. I was using my EF4-5,6 Canon lens 70-300 mm. The hardest thing was focus. The first shot the autofocus was on centar image, the other manual. I had few second to do the shots. This tutorial has been collected in *PhotoLust's favourites gallery (home of loads of brilliant tutorials) and has also been featured in November's journal. Thanks for making such a great resource! But by first glance, nice pics. Do you use burst mode? Or single? Do you have a reason not to? If the dragonfly is 0.01 sec in the position where your focus and zoom is perfect... wouldn't it be a better chance to start the burst 2sec before and after and have many many frames within that time and one of them is more likely hit within that 0.01sec wouldn't it? I don't want to rely on luck either which is why I think burst mode would give a better chance.